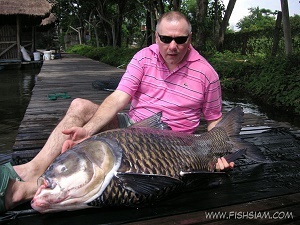 Tom Parker joined Boy on a carp fishing trip to Bungsamran Lake in Bangkok in search of the mighty Giant Siamese Carp. Fishing a quiet prebaited area of the lake in the margins, Tom caught a succession of Mekong catfish upto the 40kg mark. After a productive few hours fishing Tom received an extremely fast take that would signal the beginning of an epic thirty five minute battle! The giant carp tried every trick in the book to shed the hook finally gaining the sanctuary of the snags underneath a nearby bungalow. Boy was forced to enter the lake in an attempt to extract the monster carp from its murky depths! Carefully following the braided mainline until making contact with the fish Boy managed to free the tethered fish allowing the battle to continue. Minutes later a gigantic Giant Siamese Carp of well over 50 kilo?s was netted. The fish was weighed at 56 kgs, photographed and released back to its legendary home.